Imam Ali (A.S.) was born in the House of God, Kaabah on Rajab 13, thirty years after the Year of the destruction of the elephants of Abrahah near Makkah. He was ten years old, when the Holy Prophet (S.A.W.) was appointed as the Last of the Prophet of Allah and during the twenty three years of Holy Prophet's mission, he always stood by him and spared no sacrifice in the cause of God and the Holy Prophet (S.A.W.). His sacrifices and his efforts in the cause of Islam especially at times when Islam was seriously threatened on all sides are unforgettable. On the night, when the infidels had plotted to raid the house of the Holy Prophet (S.A.W.) and kill him, the Holy Prophet (S.A.W.) told Imam Ali (A.S.), "The infidels have decided to break into my house and kill me and God has commanded me to leave Makkah and ask you to sleep in my stead. Are you ready to do so?" Imam Ali said, "If I sleep in your bed, will you be safe?" The Holy Prophet (S.A.W.) replied, "Yes." Imam Ali (A.S.) prostrated himself to thank God and said, "May my life be sacrificed to yours, I willingly comply with whatever you command and pray God for success." In all battles, he span around the Holy Prophet (S.A.W.) like a butterfly and faced many dangers to keep him safe. In every way, he was identical to the Holy Prophet (S.A.W.) as if he were his reflection in the mirror. The Holy Prophet (S.A.W.) 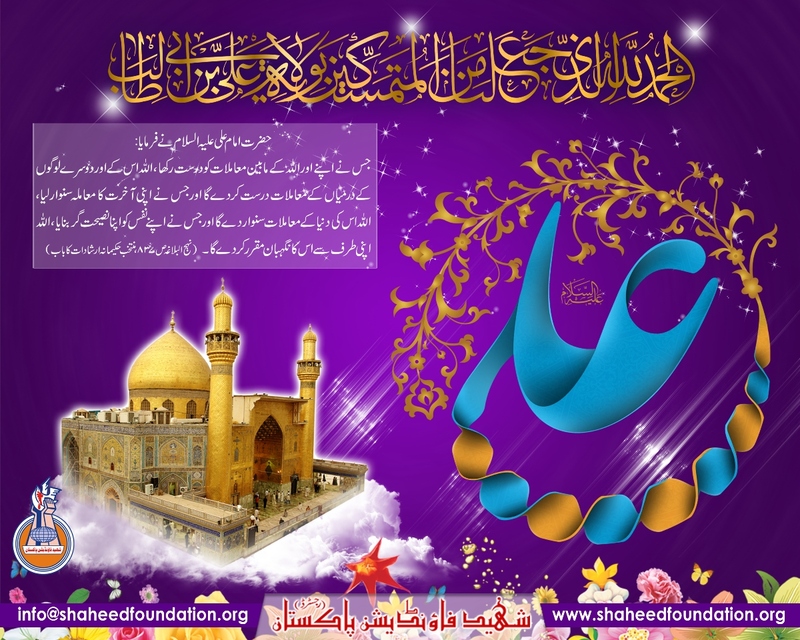 has said, "I am the city of knowledge and Ali (A.S.) is like the gate to this city and anyone who seeks entry to acquire knowledge must do so through Ali (A.S.)." The Holy Prophet (S.A.W.) has also observed, Ali (A.S.) is with truth, and truth is with Ali (A.S.) and these two will never part from one another and whatever Ali (A.S.) says is truth and whatever way he specifies is the path of truth." Although he was inalienably entitled to succeed the Holy Prophet (S.A.W.) following the heavenly departure of the Holy Prophet (S.A.W.) his undeniable right to succession was violated, nevertheless to preserve the foundation of Islam, Imam Ali (A.S.) never, during the twenty years when he was robbed of his right, did anything that might divide the Muslim community and thus afford Islam's foes the opportunity to destroy it but rather he did his best to help Islam and Muslims and did not withhold his guidance on important occasions. Finally people pledged allegiance to him as the ruler in the year 35, and his rule lasted five years until in the Ramazn of the year 40, he was martyred at the masjid of Kufah. May God bless him! His holy shrine is located in Najaf Ashraf which is one of the cities of Iraq. Excerpts from the Commander of the Faithful Imam Ali's recommendations to his son, Imam Hasan (A.S.). Say your prayers on time and pay your alms taxes (zakat) punctually and under any circumstances, whether you feel pleased or angry or furious, observe the golden mean. Be friendly to the needy and consort with them. O my son! Endeavor in the cause of God and don't quit recommending decency and forbidding indecency. Behave in a brotherly manner toward your fellow-Muslims for the sake of God. Remember God all the time. Be kind to children, and respect the elderly. Don't eat any food unless you have already given some part of it away to the needy. After the martyrdom of the Commander of the Faithful Imam Ali (A.S.) Sudah, the daughter of Ammarah called on Muawiyah to complain about their governor who was appointed by him. Muawiyah did not heed her protest and threatened to send her to the same ruler to be at his mercy. "The one who was allied with truth and was inextricably linked to faith and truth." Muawiyah said, "Perhaps you mean Ali (a)." She said, "Yes, I mean Ali (A.S.). Then she recounted her memory of that Imam, "During his rule, we were oppressed by one of his appointees, we expressed our discontent to Ali (A.S.). Having listened to our complaint, he started crying and said, "O God you bear witness that I have never told them to wrong people. " And he immediately sacked that oppressive appointee.